Environmental conditions in fast-growing cities can be appalling. In the early 1990s I lived in Hong Kong, where the harbour was brown and reeking, and the street level air was so foully polluted I had to stop wearing contact lenses because nasty red veins were forming behind them on the surface of my eyes. One evening watching TV in my small, 27th floor apartment, I flicked on a BBC documentary to see sociobiologist Desmond Morris intone, “this is one of the most congested places on Earth”. He was showing video from near the Causeway Bay subway station, five minutes from where I was sitting, and Morris was marveling at humans’ ability to live in congested, unpleasant conditions. How nice. Of course, things could always have been worse. About that same time I made the mistake of signing up for a bicycle tour of Shenzhen, the industrial boomtown just across the border from Hong Kong in China (remember, those were the days when Hong Kong was still British territory). Whoever dreamed up that bike tour was crazy. For three days we rode along half-completed roads, hemmed in between streams of sulfur-dioxide belching trucks and fetid drainage ditches. The views consisted mainly of the muddy remains of famers’ fields being torn apart to build factories and warehouses of shoddy, slapdash construction. At night we collapsed into dirty beds in squalid, unfinished hotels. The highlight of the tour was a visit to the Daya Bay nuclear power plant. What I saw on that tour was a 20th century version of what a 19th century traveller would have seen on a visit to the outskirts of Manchester, Glasgow, or any number of other factory boomtowns: the filthy, ugly side of industrial-based economic expansion. Which brings me to one of the great paradoxes in the study of environmental migration: some of the filthiest, most environmentally degraded places on Earth attract large numbers of people from other, less degraded locations. I am speaking here not only of the most obvious examples, like the slums and favelas that ring cities like Caracas, Mumbai, and Nairobi, but also the ‘special economic zones’ like Shenzhen or Mexico's maquiladora areas, where developing countries’ governments turn a blind eye to pollution and exploitative labour practices in hopes of fostering an export economy. I am also talking about older, longer established industrial cities like those in eastern Europe, where anti-pollution laws exist on paper but are rarely enforced, as well as newly emergent cities across Africa and Asia that were but small towns fifty years ago and never got a chance to build basic sanitary infrastructure. As the populations of such places expand (through both natural increase and high rates of in-migration), local environmental conditions tend to further degrade at a comparable rate. As this unfolds, a distinctive type of migration begins to emerge – the movement of middle class families out of the dirty, congested cities to locations that have better environmental conditions. Historically this has most often meant moving to suburbs around the city centre, where the family is able to maintain its existing employment and social networks while acquiring better quality accommodation, cleaner air, and neighbours of similar economic means. But today, many cities in developing countries have grown so rapidly, have become so expansive, and are so heavily degraded there are no leafy suburbs to retreat towards. Mexico City, Dhaka, and many other conurbations have become sprawling miasmas of factories, shops, apartments, warehouses, vehicles, noise, dust, and standing water that seem to go on forever in all directions. Those with the money and desire to escape such miserable conditions must go farther afield. And that is precisely what they are doing, as was reported in this New York Times article describing how well-off urbanites are fleeing China’s coastal cities for smaller centres in places like Yunnan in search of better air quality. Urban environmental degradation in developing countries is also leading some people to immigrate to Canada. Dr. Luisa Veronis of the University of Ottawa and I, along with graduate students Amina Mezdour, Reiko Obokata, and Mohammad Moniruzzaman, have been studying this phenomenon. * With help from recent immigrants from Africa, Asia and the Caribbean, we have been documenting how declining ecological conditions in congested cities have led young professionals with families to give up good jobs and economic prospects in their home countries to start again from scratch in Canada. Often, these immigrants find when they get here that their educational and professional qualifications are not recognized by Canadian employers. They end up taking entry level, minimum wage jobs for which they are overqualified, or go back to school yet again, but it’s a sacrifice they are willing to make because they have more hope for their children’s future than they do for the future of the city they left behind. 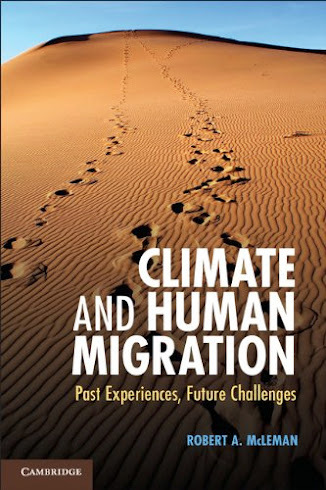 This month the peer-reviewed journal Population and Environment published a research note in which we detail some of our preliminary findings and outline the complex chain of causation that generates this type of migration. The article is free and openly accessible, click here to download a free copy. There are serious implications for the cities these immigrants are leaving behind if this phenomenon continues. The middle class is the mortar with which a successful city is constructed. If they leave, a city has no long-term future. Ask Detroit. A population that becomes bifurcated into a great many people with little or nothing and a small ruling class that controls all the wealth and assets is likely to descend into political instability and economic stagnation. If you have read any of my past writings, you will know I am an avid student of the Dust Bowl migration of the 1930s. The people who fled the drought-stricken Great Plains during that period were disproportionately young families with hard-working parents – i.e. the middle class. The places they moved to, like Bakersfield, California, benefitted over the long run from the unexpected influx of energetic young people (even though Californians initially tried to discourage the migrants). I have been to the places the Dust Bowl migrants left behind. They withered over subsequent decades to dusty, forgettable, lifeless places. From the moment their young families packed up the car and headed west, those places were doomed. Do not get me wrong, I’m not saying that Shanghai or Dhaka or Jakarta are ever going to become abandoned; there is far too much power, wealth, and economic opportunity concentrated in such places, and their populations will continue to grow in coming decades. What I am saying is that urban ecological quality needs to be of far greater priority to the governing authorities than it presently is. If not, bright young people are going to leave polluted cities in ever larger numbers, to the long-term detriment of the sending countries and to the benefit of receiving countries like Canada. If urban ecological integrity is measured as a form of societal wealth (which it should), the future will see the rich getting richer and the poor getting poorer.